Tickets are available for the annual BBQ at Mathis Auditorium, July 2, 2018, where you can help the Lowndes County Democratic Party (LCDP) Ride the Big Blue Wave. All Democratic candidates running for districts all or part in Lowndes County have been invited to speak, including for Lowndes County Commission, State Representative, statewide offices, and for Congress. 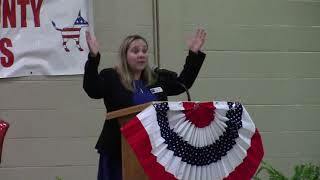 Last year, Sarah Todd, Democratic Party of Georgia vice chair of congressional district chairs and county party liaison, was among the LCDP BBQ speakers; and there is video. In addition to providing a venue for Democratic candidates to speak, good food and a good time, the BBQ is a fundraiser for LCDP. This entry was posted in Candidates, Congress, Elections, GA Legislature, Lowndes County Board of Commissioners, Meetings and tagged Aaron Strickland, barbecue, Candidates, Chair, Congress, Demarcus Marshall, Dennis Marks, Dexter Sharper, elected officials, Elections, GA Legislature, Georgia, Georgia House of Representatives, Glenn Ritchie, Gretchen Quarterman, J.D. Rice, James LaPlant, Jim Parker, LCDP, Lowndes County, Lowndes County Board of Commissioners, Lowndes County Board of Education, Lowndes County Commission, Lowndes County Democratic Party, Lowndes County School Board, Meeting, Meetings, Nerma Dave, PR, Richard Saeger, U.S. Congress, Valdosta, Viviann Miller-Cody on June 8, 2018 by lowndesdems. You can Ride the Big Blue Wave with the Lowndes County Democratic Party (LCDP) at the annual BBQ at Mathis Auditorium, July 2, 2018. All Democratic candidates running for districts all or part in Lowndes County have been invited to speak, including for Lowndes County Commission, State Representative, statewide offices, and for Congress, as well in nonpartisan races. In addition to providing a venue for Democratic candidates, good food, and a good time, the BBQ is a fundraiser for LCDP. Tickets are being printed and you can buy one or two or more, and you can help sell them. Sponsors are also welcome. Come on down every first first Monday of the month to the LCDP meeting, next Monday, April 2, 2018, at Mama June’s on Inner Perimeter. It’s a social gathering, and it’s a business meeting. It moves around, so if you have a favorite location for fifty or so of your closest Democratic friends, let us know. Party business doesn’t stop after the monthly meeting adjourns. There’s a BBQ to put on, candidates to elect, issues to air, and bills to pay. A few officers or committee members can’t do it alone. You are the party, so you can help us all Ride the Big Blue Wave. This entry was posted in Candidates, Congress, Elections, GA Legislature, Lowndes County Board of Commissioners, Lowndes County School Board, Meetings and tagged Aaron Strickland, barbecue, Candidates, Chair, Congress, Demarcus Marshall, Dennis Marks, Dexter Sharper, elected officials, Elections, GA Legislature, Georgia, Georgia House of Representatives, Glenn Ritchie, Gretchen Quarterman, J.D. Rice, James LaPlant, Jim Parker, LCDP, Lowndes County, Lowndes County Board of Commissioners, Lowndes County Board of Education, Lowndes County Commission, Lowndes County Democratic Party, Lowndes County School Board, Meeting, Meetings, Nerma Dave, PR, Richard Saeger, U.S. Congress, Valdosta, Viviann Miller-Cody on April 1, 2018 by lowndesdems. Come out to hear and meet the candidates face-to-face. Many of them already spoke at the annual LCDP BBQ in July and at the AAUW Candidate Forum in September, and you can see the videos of those first, if you like. Then come and hear, see, ask questions, and offer to help a Democrat get elected. Dexter Sharper, Georgia House District 177, is not up for election this year, but he can probably provide some tips for those who are. This entry was posted in Candidates, Elections, Meetings and tagged 2017-10-02, Candidates, Chair, Dexter Sharper, Elections, Georgia, Gretchen Quarterman, J.D. Rice, LCDP, Lowndes County, Lowndes County Democratic Party, plan, platform, Valdosta on September 28, 2017 by lowndesdems.